Following two really good and straight forward albums, Ravenhead (2015) and To The End (2012), the german outfit Orden Ogan this time continue to showcase a mature and great sense for melodies, atmosphere and grand arrangements. Vocalist/guitarist Seeb Levermann, who also has produced the album, has created a delicious sound landscape; rich, full, heavy and very fitting to the overall Wild West lyrical theme. However, they really go all-in on the modern age Blind Guardian formula this time. As a result of that, the outcome is unfortunately very saucy and most of the material all blends together to a thick wall of a gray and anonymous mass. To me, even after a dozen spins, half of the album feels like the same song in a loop with very few variations. The tempo, the song structures and especially the choruses feel forged from one and the same flamboyant formula, nicked from a corner of a dusty drawer in Blind Guardian's writing chamber. Four songs into the album it gets really interesting for the first time. Vampire In Ghost Town stands out a bit as the album's best track with great riffs and leads and also contains a nice and subtle Running Wild vibe, which is something that I miss from the previous albums. One Last Chance is another song that catches my attention due to its guitarwork and slightly above average heaviness on this album but is nothing I really remember afterwards. 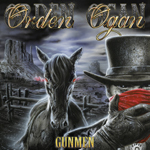 I am not that keen on Blind Guardian's development the past decade either, but if I have to choose I prefer to listen to Orden Ogan. At least there is still something fresh and vital to it and this album do have its occasional and brief moments (parts of Gunman, Fields Of Sorrow and Ashen Rain) even though I greatly miss distinct and more captivating riffs with character. See also review of: Ravenhead , To The End , Testimonium A.D.